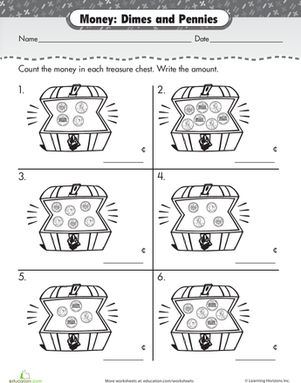 In first and second grade, kids spend a lot of time learning to count and use money. Don’t be surprised if it doesn’t quite “gel” for your child for several years. 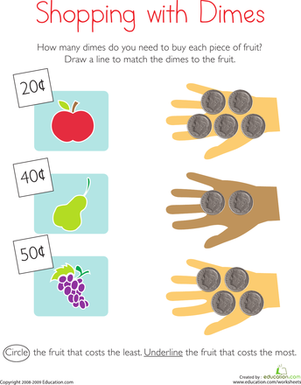 Our money system really doesn’t make much sense until kids are fully comfortable with quite a few fundamental math concepts, including the 1 to 100 number line and place value (tens, hundreds, and so forth). 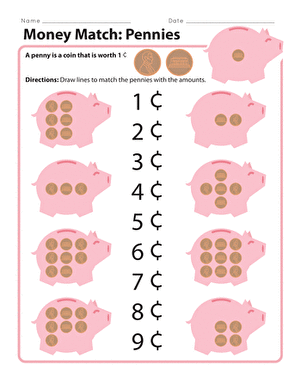 Here’s a coin counting game for first and second graders that helps move that process along. In this game, the winner will be the person who, in six turns, can put together dimes and pennies to total as close to $1.00 as possible. Start by making a scorecard for each player. Have her create a column labeled "pennies," a column labeled "dimes," and a "value" column. Have her place the dimes and pennies in two piles in the middle of the table, between players, so that everyone can reach them. Players should take turns rolling the die. Each player will take the exact number of either dimes or pennies as are shown on the die. For example, if the die shows the number “5,” each player might take 5 pennies, or one player might take 5 dimes and the other 5 pennies. 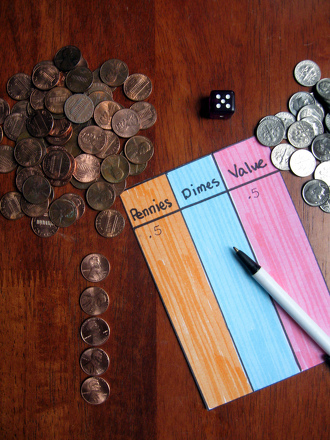 Players put their dimes in the dime column and their pennies in the penny column, and write the value of the coins they picked up after each turn. As the rolls add up, so will the coins. 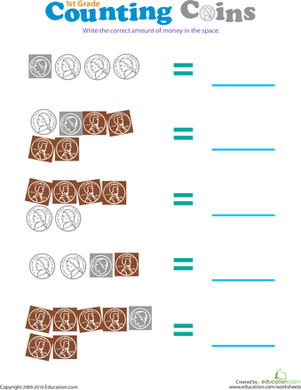 Whenever a player gets ten pennies, she must automatically trade them for one dime, and place the dime in the correct column. After six turns, everyone stops and counts up the money. Who got closest to $1.00? That’s the winner! 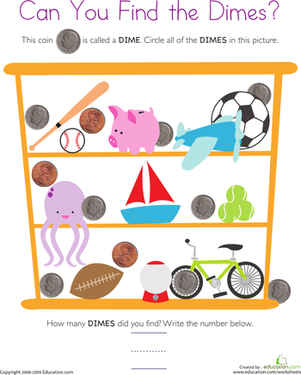 This game allows kids to explore three primary math concepts in one: by moving pennies into the tens column, your child enacts the idea of “place value”—“ones,” “tens,” “hundreds,” and so on. 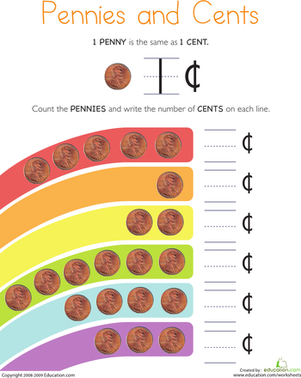 By counting up to $1.00, your child practices moving around on the number line…with money. Not bad for a simple game; in fact, we recommend you play it over and over again with your young mathematicians and prepare to be delighted by not only the fun, but the learning, you share. 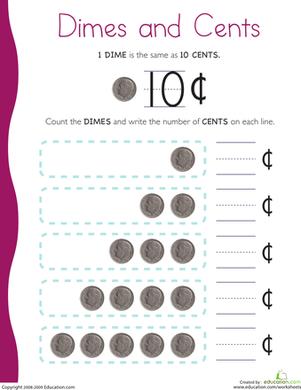 Students draw dimes and pennies to practice solving for 10 more and 10 less than a given two-digit number in this money math worksheet. Start out with pennies. 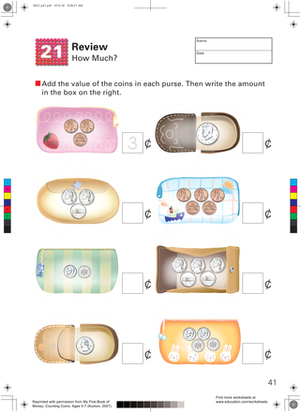 Checking out this cute worksheet just makes cents. Use these play bills to add excitement and real life context to your math lessons.